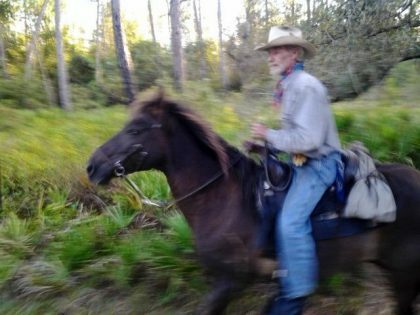 Brent Bachand on little Charlie, a wild Florida Cracker horse. I grew up on the east side of Orlando down by Jetport, Curry Ford, 436, and nothing like it is now. That was all country back then. It was all country and T.G. Lee Dairy had its cows down there off of what is now 436. There wasn’t even a road back then. You would have to go to the Daetwyler Conway Road, Daetwyler Drive to get back that way. And the airport was where UPS is now, that was our airport back then. Everything else was the Air Force Base, McCoy Air Force Base. And everything behind that was nothing but cows. Cows, cows, and cows. All the way from there to Stuart, Florida back then all through St. Cloud, Kissimmee. Because I used to ride back there with several different men back in the day. They would be counting cows or whatever they would be doing. I was just a tagalong kid. So nobody paid attention to me until I started really riding horses. Then they started taking an interest because I could ride horses. Really I don’t think they looked at me so much as a kid anymore they just looked at me as someone who could get a horse ridden. And because they were still using horses back then, so it was, it would be like the mechanic today. You would take your car to get fixed for tomorrow, well you would bring your horse to me. And as a kid I would just literally ride the hair off them. So by the time I got finished they were in pretty good shape. And it wasn’t that I was a great horse trainer or anything. I just got on them like a kid and stayed on them until they acted right. And then when they started acting right I would take them back to wherever it was that needed their horse fixed. And that’s pretty much how I started. 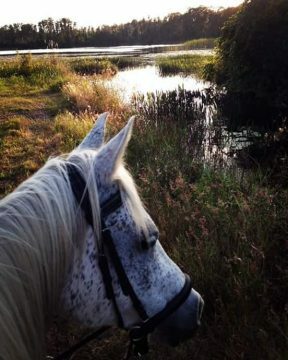 I actually started by seeing horses out in pastures and then jumping on them and going for rides…. So my gist in the whole thing was being a Bronc Rider. We call it a saddle breaker. I broke horses to ride. So after a few years, and I worked several ranches, I was pretty much an independent contractor. So I went wherever somebody would hire me, I went there. 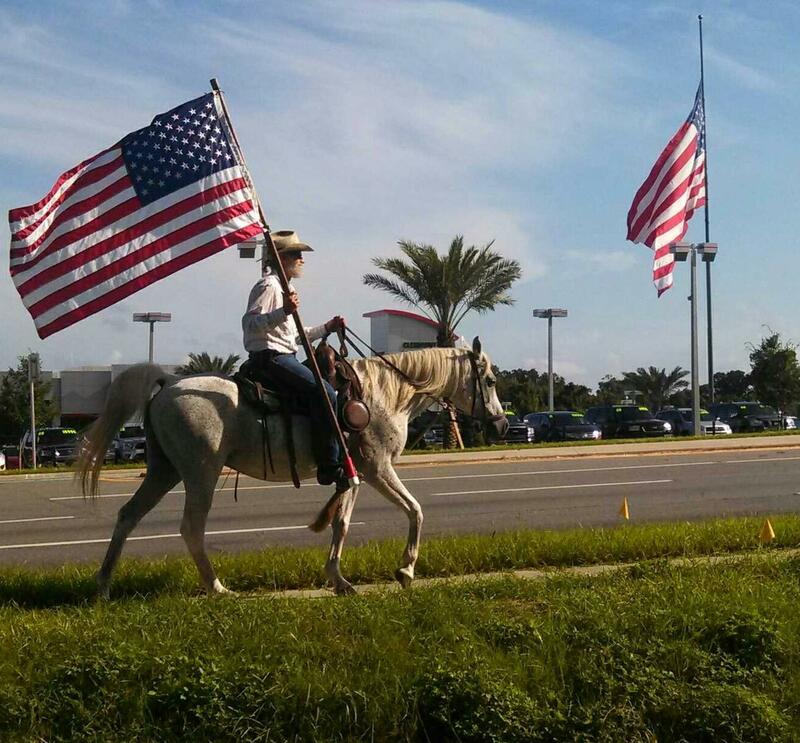 So, I’d been on several ranches throughout Orange County, Lake County, Osceola County. I worked on Bronson’s Ranches. I’ve worked on Parson’s Ranch, I’ve worked on the Jefferson Ranches. But as time went on I discovered I wanted to know more about horses. I didn’t want to just be a cowboy, I wanted to know more about horses. So I went off and I started riding thoroughbred horses, exercising them. Because of my size I could get on thoroughbreds to exercise them. 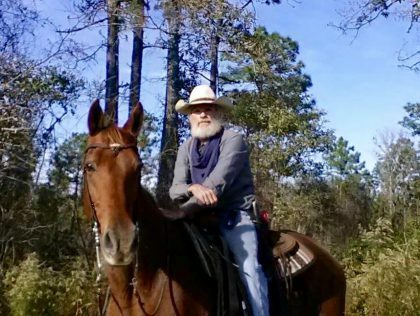 And it was a job that I learned I could do almost anywhere as long as there was a horse… Anywhere around the United States… I’ve traveled all kinds of places around the country…. And I’ve worked at Arabian Nights, major shows, Shepherd of the Hills in Branson, Missouri. I’ve worked in western shows out in Tombstone, Arizona. Private shows. 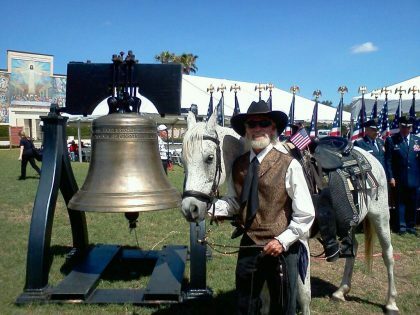 Gunfighters, I’ve been a gunfighter all kinds of different places… I met the people that have trained horses for the Royal Lipizzaners – fabulous, fabulous great horse trainers…. So by being able to go to circuses, I worked in circuses with circus horses. I’ve worked with theatrical horses like Arabian Nights. I’ve worked with rodeo horses. I’ve trained horses to drive. I’ve trained horses to go in elevators. 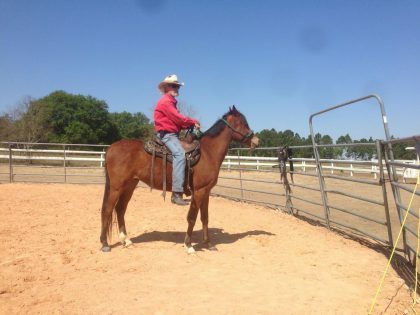 I’ve trained horses for pretty much anything that people need a horse to be trained for. 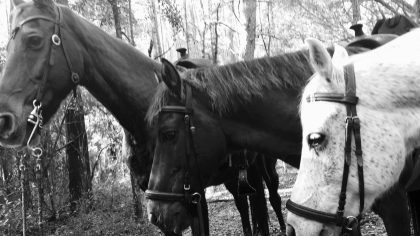 Now, I work just mainly on private horses for private people and not too much theatrical stuff anymore. Not too much any of that kind of stuff. I find I get more enjoyment helping kids, helping people. You know, the horse people that are into horses now are either kids or they’re in their fifties. There’s nothing in between. So it’s people who have always loved horses and now they’re starting to get into horses so they like to know about horses now…. I’ve worked with autistic children, cerebral palsy. Actually that’s kind of what started me into this. A friend of mine, his sister had cerebral palsy. And I noticed when I would ride my horse through to his house, his sister would get very excited when I would pull up. Five years later she was brushing the horse. I just put a brush beside her wheelchair. First it was just touching him. I’d put the horse next to her like this and she couldn’t even do that. She’d be excited. By five years she could brush that horse. When I saw the power of the horse and what it did to people and for people…. Brent Bachand and Pony, 1963. This picture is on a street called Lancashire Lane which is right off Conway Road. It’s 1963 so I am six years old right here. A man is walking down the street with this pony and this outfit and I already had the hat and for fifty cents he took pictures on the pony. My brother got one. The guy down the street got one. He did this all over the place. So this is, I think it’s September of 1963. It was right before John F. Kennedy got killed because I was in the first grade. 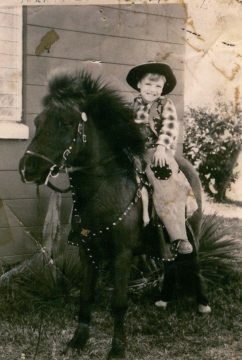 So when I came off of that horse I looked at my mom who gave me the fifty cents – and that was a lot of money in 1963 – to dig up a dollar for me and my brother to have our pictures taken. But as soon as I saw them I was like I don’t want no ice cream ever. I want this. When the ice cream truck comes by I don’t want one. I want this. Take all my fifty cents. Take whatever money it is, I’ll do whatever it takes to get that right there. So I jumped on there and I got my picture taken and when I got off of that horse I looked at my mom and said, “I’m a cowboy!” And that was what I was from that point on…. Brent Bachand and Banjo at the I-75 land bridge in Dunnellon on Veteran’s Day, 2014. How did you get started presenting for patriotic events in our community? Banjo draped in the American flag on Highway 50. 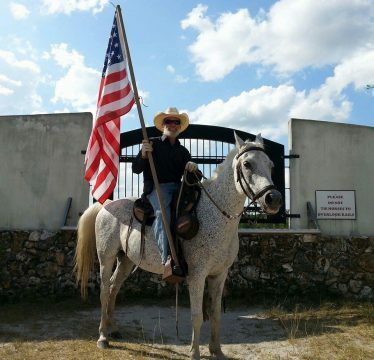 I put an American flag over his back and I started riding down Highway 50 with my other horse and pony and that’s where I’ve been ever since is riding up and down roads with the American flag not for anybody but me. Just to show my respect and honors for those people…. Brent Bachand with Banjo in Clermont, September 11, 2012. I normally go to Greenwood Cemetery. I have relatives that are buried there and they put on a great Memorial Day service and its very respectful of our service men and women. And what I’m doing here – this is called the – see how the boots are backwards. That’s what I do. 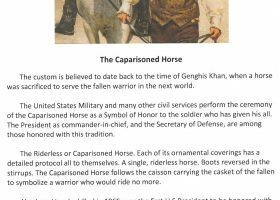 Which is known as the riderless horse. 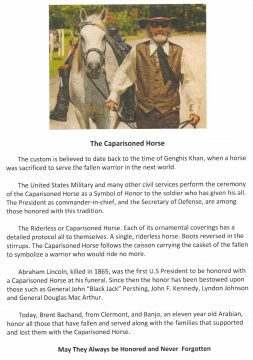 Brent Bachand and the Caparisoned Horse. And so I do that in honor of our veterans. 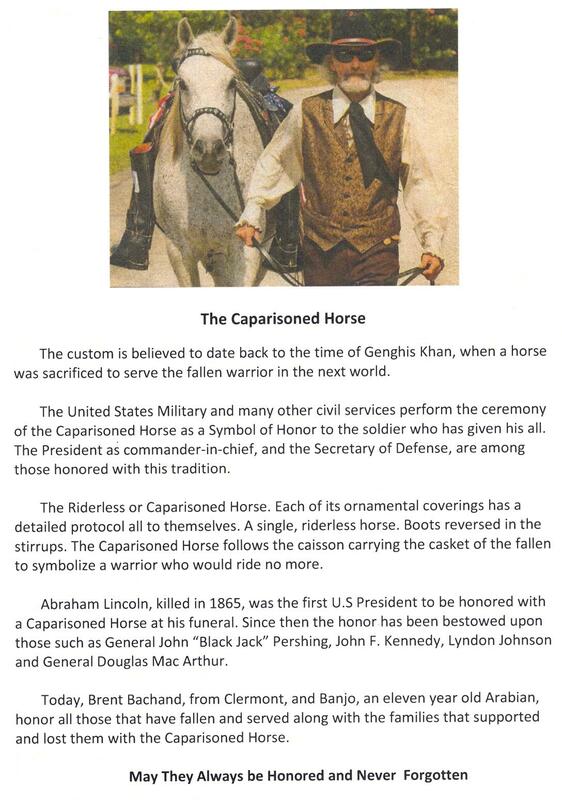 This was an honor that was bestowed amongst, say, your leader if you were out on a campaign and the captain was killed then the first horse would be like this with his boots in the stirrup backwards looking at his troops. Therefore when they came into the fort you would know that the captain or leader had been killed because his horse is empty. Brent Bachand and Banjo at Woodlawn Cemetery, Memorial Day 2013. You have grumpy ones. You have prissy ones. You have bad attitude ones. 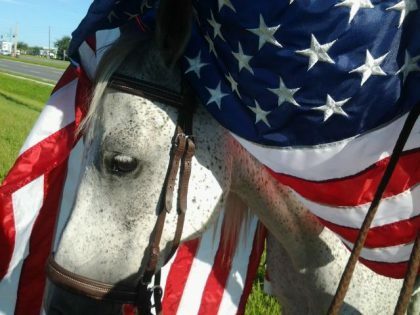 You have – see the thing about a horse – when Banjo passed away, a friend of mine said, “You gave that horse most of the personality that he had. Because you trained him.” They’re just like dogs. Yeah, Banjo had a great personality because he knew what his job was. When we would go to retirement homes he knew…. If you never rode a horse that was the horse I put you on. 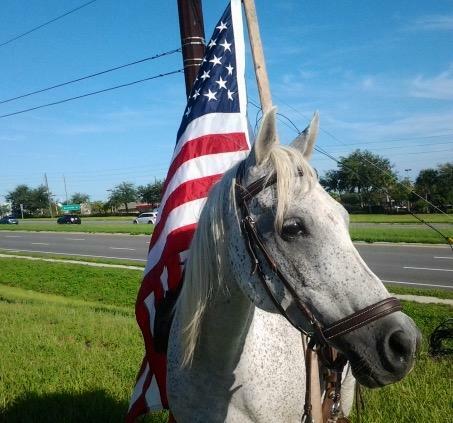 I used the horse to display the flag and things like that because it was more pronounced. So I started that. Then as I kept going I kept noticing how we’re losing our patriotism. 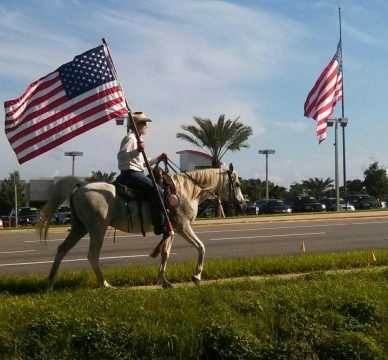 So then on any patriotic holiday I would go out to Highway 50 in Clermont and I would ride Banjo with my flag up and down. I started at 9/11 the next year I started doing it. So I do it every 9/11. Every Friday before 4th of July, every Memorial Day weekend. I ride somewhere. Plus go to Memorial Day events. Sometimes two in one day. This is just what I do. I mean, nobody pays me to do it or anything else. I do it on Friday because I want people to see what the holiday is for. I want them on their way to work to remember what the holiday is about. It’s about this. Brent Bachand with Banjo at Woodlawn Cemetery, Memorial Day, 2015. It’s not about chicken or BBQ sandwiches or hot dogs or the pool or beer or anything else. It’s about people sacrificing for what you have right now. And I got always great, positive responses. Half of OPD is pictured with me and my horse on the side of Highway 50. Where they’d be coming into work – they live out that way – and pull off the side of the road to get a picture of me with Banjo. Highway patrolmen, Firemen… We’ve done many parades. That’s the Veteran’s Day Parade. I rode with a group called the Civil War Round Table. I’ve trained horses for reenactments. I hope to be carrying on my tradition of riding. I have a picture of me with Banjo on Orange Avenue two nights after the Pulse shooting…. Brent Bachand with Banjo on Orange Avenue after Pulse, December 14, 2016. I have an autistic child that comes over. They cannot control this child until he gets on that horse. While he’s on that horse he’s happy. There’s something – a mysterious thing in the horse. There’s a chemistry there somewhere and it goes into the souls of people, it really does. And I’ve been blessed because I found that connection early in my life and I stuck with it…. Brent Bachand at the Reins on Lake Eola. 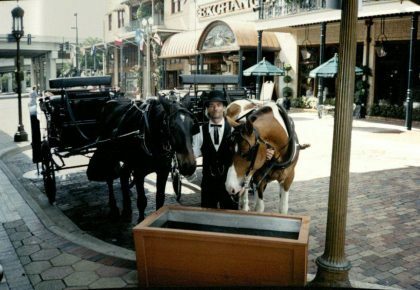 I drove carriages in downtown Orlando for ten years. 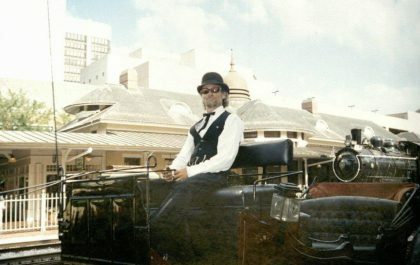 I drove carriages at Church Street Station and I’ve hauled more people than you could shake a stick at around here and Church Street, Lake Eola. Brent Bachand with horses at the Church Street water trough. I did over a thousand weddings, parades, parties. You name it – any kind of outdoor event. I did it. Disney. I did events out at Disney. You don’t do events out there any more because they have their own carriages…. Brent Bachand Carriage Driver at Cinderella’s Castle. 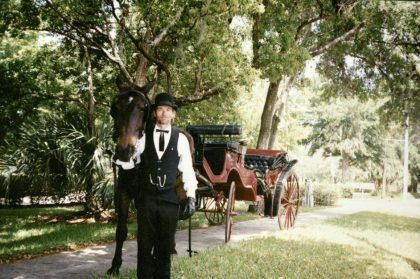 But the history of the Orlando Carriage Company goes back way to the 1800’s. This was actually one of the hubs. 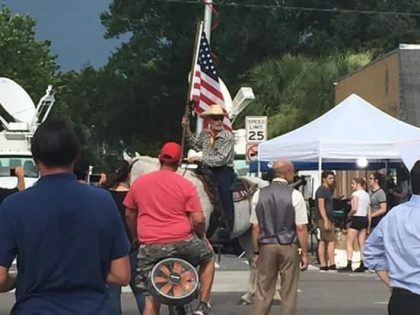 They would come, people would come and pick up a carriage in Orlando, and they would take them all the way to Brooksville. Because that’s where the train would come through to pick it up to go to Tampa. Now in hindsight it probably would have been just as easy to ride all the way to Tampa. But, they wouldn’t do that. So the Orlando Carriage Company, the original one sat right about where the train tracks are now on Church Street. And they used to have upstairs – they would call the Carriage House. 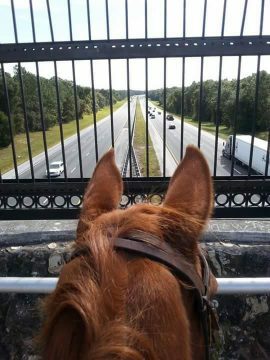 The carriage drivers would stay up there and somebody would call…. 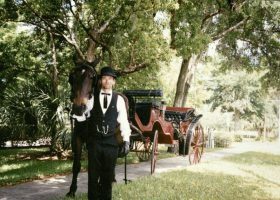 Brent Bachand with Orlando Carriage Company in downtown Orlando. So it was kind of interesting to do the same thing a hundred years later. I’ve met a lot of the town’s people. 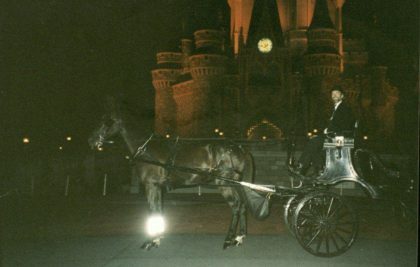 I used to take Glenda Hood for carriage rides when they would go around town to see what’s happening. As a matter of fact, I invited her downtown one night to see Orlando at night because they always leave about six o’clock. So I told her, I believe Joe was her body guard, and I said, “Why don’t you come down some night and I’m going to take you and show you what your town is like on a Friday night at 10:30 at night…. 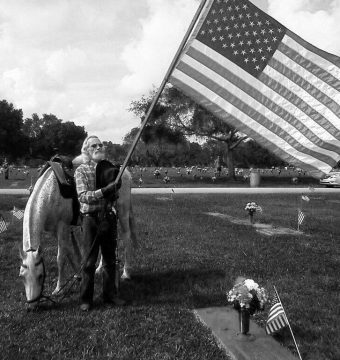 Florida horse trainer Brent Bachand. People always ask me how did you become a horse trainer? Well, it’s very simple. I had a bad horse. And then I got another bad horse and I sold that one. 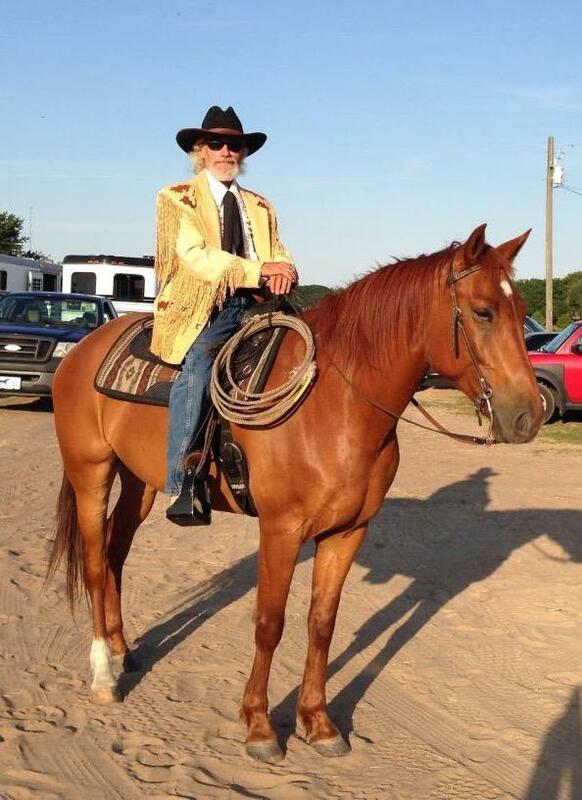 And after about 25 of those bad horses I started becoming a pretty good horse trainer…. 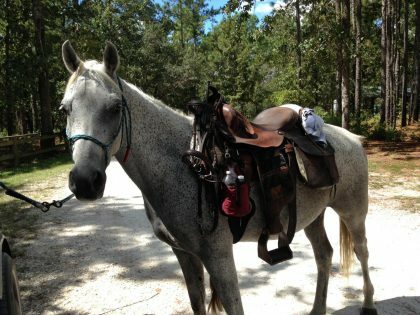 It’s not hard to buy a bad horse. Most people just give them to you. I got this horse from a guy one day comes over my house. I used to live in Bithlo… They had a place called the White House Tavern. We used to ride our horses up to the White House Tavern, but you had to stay outside because somebody would steal your horse. So, I’m out in Bithlo, so this guy comes over and he says, “Take this horse. I don’t want it… They tell me that you can do something with him.” I said, “Okay.” It’s an old ratty horse, put him over there. Just take him out of your trailer and put him over there. I’ll look at him tomorrow. So maybe five months later I’m riding down Highway 50 and I come to the Circle K and it’s the same guy. And he says, “Wow, I never did look at your horses, but thy tell me you have some nice looking horses. I like that one. How much you want for him?” I said, “Well, he really isn’t for sale.” “I’ll give you a thousand dollars for him.” I said, “Why don’t you just follow me up the road to my place.” He said, “Well, I’ll get my trailer and I’ll meet you there” …. He comes back an hour later. The guy pays me a thousand dollars takes the same exact horse. And I even told him, “This is the horse you dropped off about six months ago.” He said, “Ain’t no way.” I said, “This is the horse that you dropped off.” I said, “Fine. I’m not going to argue with you.” I took the thousand dollars. I seen him maybe four months later. Then he realized it was the same horse. He said, “Wow, I never realized that you could do that much with a horse.” So I ended up training two more horses for the guy. Right now I train from Clermont to Daytona Beach to I’ve gone as far as almost to Miami to train horses. I’ve been flown up to Massachusetts to train horses for big shows. I learned a lot from that man Gaylord Maynard. I learned a lot from him about training horses. And my mentor would be Ken Newman from the Orlando Carriage Company. I learned a great deal from him. These are old horsemen back in the 50’s and 60’s. You know, when you had to have a horse ready. So they had techniques that I didn’t know about because I dealt with a lot of cowboys who were very brusque and rough… Where these guys showed me how to get the same results but you didn’t have to do those kind of things. You used your brains more than your muscles. 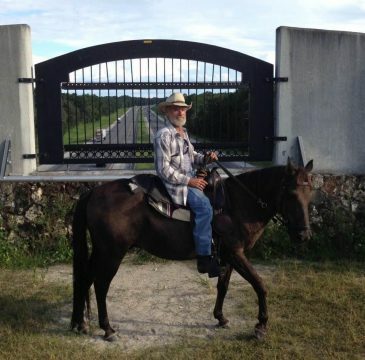 And I’ve been training now for probably, I don’t know, 20 years, I guess, I’ve been training horses…. Saturday I’m going to a youth rodeo. The girls are going to be performing in it and they’ve done really well. They started out at like 22 and 23 seconds and now they’re the 17 and 18 seconds that they’re running so they’re doing real well. That’s very rewarding when you see that. When you look back and see what they’ve done and them doing so much better… I have a page on Facebook. It’s called horse teaching. It’s open to the public. But, it’s got kids I’ve trained on there…. So, it’s very rewarding to see. And now, I have clients that are going on and teaching their kids. teaching their grandkids… The rewards I get – I have cards, pictures, I have things that kids have written me… The horse has made that kind of an impact on the people. I just bring it. 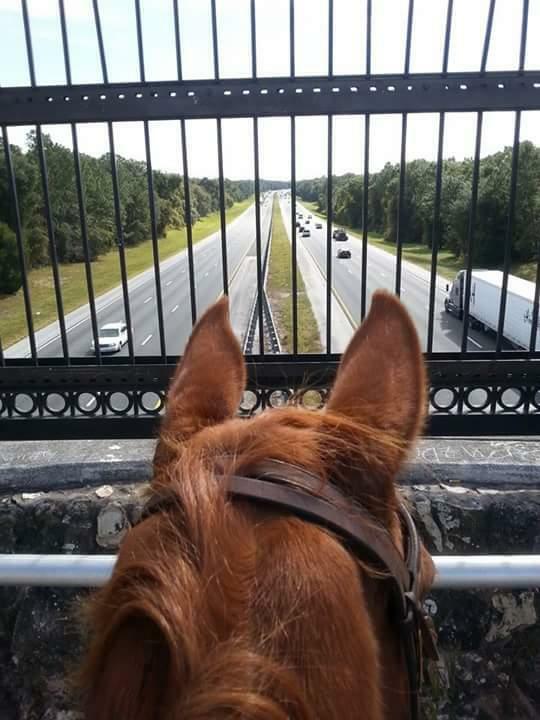 Brent Bachand’s Tennessee Walking Horse, Roscoe, at the land bridge on Interstate 75, October 2015. All photos courtesy of the Brent Bachand Photo Archives. 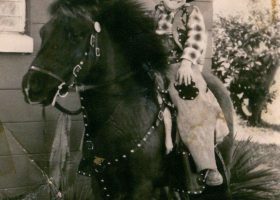 Oral history interview with Florida horse trainer Brent Bachand at the Orlando Public Library on August 2, 2016.